Today is John Steinbeck’s 114th birthday. I first read “The Pearl” in high school. I know I read “Of Mice and Men” and “The Grapes of Wrath” around the same time, but it was “The Pearl” first. I had never read anything with that narrative before, he compelled me to care about those characters, to think about them when I wasn’t reading the books, and to be excited to read more. There is no doubt that “The Grapes of Wrath” is one of the best novels ever written. If you aren’t going to read the book, watch the movie, it will stay with you. But you should read the book. The world is a better place because he was in it and still feels the loss that he has left. 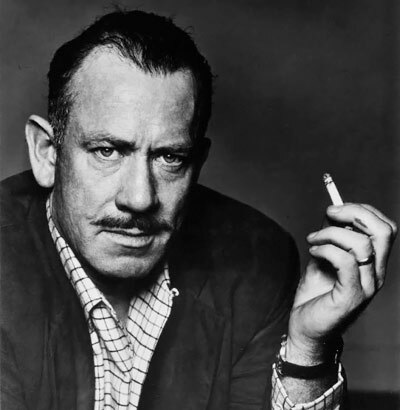 BEST KNOWN FOR: John Steinbeck was a Pulitzer Prize-winning novelist whose book “The Grapes of Wrath,” portrayed the plight of migrant workers during the Depression. In the late 1930s, he was sent by a newspaper to report on the situation of migrant farmers, so he got an old bakery truck and drove around California’s Central Valley. He found people starving, thousands of them crowded in miserable shelters, sick with typhus and the flu. He wrote everything down in his journal, and in less than six months, he had a 200,000-word manuscript. The Grapes of Wrath (1939) won the Pulitzer Prize, but the author was roundly condemned in some quarters for his anti-capitalist, pro-New Deal, pro-worker stance. During World War II, Steinbeck wrote some government propaganda, and although he returned to social commentary in his post-war fiction, his books of the 1950s were more sentimental than his pre-war works. In the 1960s, he served as an advisor to Lyndon Johnson, whose Vietnam policies Steinbeck supported. Many accused him of betraying his leftist roots. Many of Steinbeck’s works are on required reading lists in American high schools. In the United Kingdom, Of Mice and Men is one of the key texts used by the examining body AQA for its English Literature GCSE. A study by the Center for the Learning and Teaching of Literature in the United States found that Of Mice and Men was one of the ten most frequently read books in public high schools. At the same time, The Grapes of Wrath has been banned by school boards: in August 1939, Kern County Board of Supervisors banned the book from the county’s publicly funded schools and libraries. It was burned in Salinas on two different occasions. In 2003, a school board in Mississippi banned it on the grounds of profanity. According to the American Library Association Steinbeck was one of the ten most frequently banned authors from 1990 to 2004, with Of Mice and Men ranking sixth out of 100 such books in the United States.